I think Logan (my husband) and I began talking about where we would honeymoon before we were even engaged. We quickly disregarded a tropical vacation since, being two law students, we recognized that we were just a little too "type A" to sit on a beach for 2 weeks. So... we happily, quickly agreed on Italy. Although we met in law school and spent many of the early hours of our budding relationship hitting the books, we realized that we had grown closer as we shared our love of good food and good wine and I shared with Logan my love of cooking. We had traveled to Santa Barbara for wine tasting regularly during our relationship and Logan proposed in a special Santa Barbara restaurant. Our favorite pastime had clearly become the daily experience of planning and cooking delicious dinners together. For us, Italy was the ultimate epicurean destination. Of course, the additional bonus of amazing history and art appealed to us, especially to my history-buff husband. 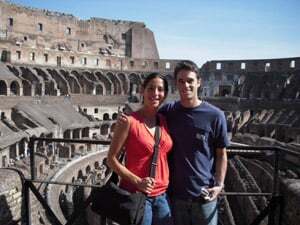 Logan took over the honeymoon planning about 5 months before the wedding and used his honed research skills to put together an amazingly well-thought out itinerary for our 14 days in Italy. This made setting up our Traveler's Joy website so easy. Our friends and family appreciated knowing specifically what part of our honeymoon they were contributing to. The trip was perfectly decadent and yet, because of Logan's hard work in planning, we knew we got great value for every euro we spent. Logan's sweet Gram purchased our airfare as our wedding present, which helped a lot too. All in all, the trip set us back about $6000. It was worth every dollar and we would absolutely recommend this honeymoon to any other couples who want to immerse themselves in an incredible culinary and historic experience. 10/07/08- We arrived in Milan at about 7 am, easy customs and our bags were there as soon as we walked out. We then took a bus to the Milan Central Train station (terrible traffic- took over an hour). Finally got to the train station, figured out how to buy a ticket and got on the 10am train (which was our goal). Got on the train starving- but too scared to get off and grab food and water- so we waited for the dining car to be open and had a delicious ham and cheese pressed panino that saved us! 3 hrs later we got to Florence/ Firenze Train Station and walked to the car rental. It took about an hour to get our car, then we were off in our mini black Mercedes hatchback. Thank God we have our TomTom GPS system b/c we had 3 sets of written directions to the Villa, but NEVER would have made it here if we had to search for street signs. But TomTom eventually got us to the right place and the Villa Il Poggiale is beautiful. We completed our travels after a full 24 hours! We went on a tour and found our room right next to the dining room- which is just fine with us. We got about a 1 hr nap in, then got showered and dressed to head into the nearest town of San Casciano for dinner. We decided to grab a glass of Tuscan wine from the honor bar and enjoy the sunset (we have beautiful pictures) from the patio of the Villa. We stopped into the reception desk to ask which of the restaurants on their recommended list was the absolute best in San Casciano since we figured we'd only go into the town one time. They made reservations for us at Cinque de Vino and mapped our 2 minute drive into town for us. Amazingly we got there without getting lost, found our parking lot and restaurant with time to spare. We walked around the medieval town for 45 minutes, then happily returned to the restaurant to have our first Italian feast. We were greeted by the owner- a very friendly Italian man who is clearly passionate about the food he serves. He went over the entire menu with us including many items not really on the menu. He helped us with both food and wine selections. To drink we had a bottle of Rosso di Montalcino (? )- the wine that eventually serves as the base for Brunello. Our antipasto course was a variety of chef's delicacies: spinach and ricotta flan; fried zucchini blossoms, sage, and stuffed eggplant; pork (called tonno b/c it resembles tuna) over white beans; and bruschetta with sweet onions-to be eaten in that order at the chef's request! For our pasta course, we had a lasagne with smoked cheese and guinaciala stuffed with burrata and spinach in a sauce described as being "little pieces"- which turned out to be a combination of eggplant, tomatoes, and onion and very delicious. For our secondi, we had a veal chop and a fiorentina steak sliced and served with rucola and parmiggiano- both were fantastic. We had decided that gelato was out b/c we were already too full (to eat it... but also to walk to the gelateria)- but when the chef practically insisted that we share his chocolate cake, we could not say no. As if that wasn't enough, he brought us a dessert wine- sweet but not syrupy- that went perfectly. We finally took a goodnight photograph, walked to our car, and were back at the Villa in less than five minutes. 10/08/08- We woke up this morning at 4:30am... apparently we were not quite adjusted to the time change. After an hour of TV, we did make it back to sleep-a deep sleep-all the way until 8:30-that is late for us! We got up and headed to the breakfast room at the hotel. Not expecting to find much, we were amazed by the spread put out at the Villa including homemade breads and jams, prosciutto and ham, soft-boiled eggs (my new favorite way to eat eggs) and some type of breakfast cake that had coconut and chocolate, but somehow was not too sweet. We ordered cappuccinos since Logan warned me that we would only be allowed cappuccinos before noon- trying to do as the Italians do-only espresso after dinner. We ate outside- it was a little chilly but too beautiful to pass up. After breakfast, we got directions to Siena and set out. We finally learned that maps and street names are useless so we just followed all the blue signs that said "Siena" and found it without any problems. Unfortunately, we weren't the only ones who found it-it was market day and we drove in circles and waited for nearly an hour- trying to find parking. Whenever it finally looked like we found a spot or someone else was leaving, we were only faced with Italians honking at us (apparently we weren't following the Italian rules of waiting-for-a-spot decorum) or a driver unable to extract his (tiny) car from the spot because another car had parked illegally way to close to him. We had to give up. We could not spend our entire second day in Italy sitting in a parking lot... so before Logan could get too grumpy (ha! ), we decided that we would head back on the speedway to San Gimignano- a town described as very touristy, but somehow still a must-see- and it was. We easily (thank God!) found parking and walked through the city gates. Immediately, we were in the middle of a medieval town preserved maybe too well. We strolled through the souvenir and wine shops, eventually making our way to a 9th Century well surrounded by towers. Then we went further up hill to the duomo and entered our first church on the trip. It was literally covered in murals, contrasting Old Testament and New Testament. On the left was the creation story, on the right- Jesus' birth; left- Job's suffering, right- Jesus' suffering. All very beautiful. Back outside, we walked further up through the town to some of the best views we've seen so far of the Tuscan countryside. We headed up even further to the Saint Agostino church and had lunch outside its steps at the Locanda di Saint' Agostino where we enjoyed San Gimignano's famous white wine, a papardelle with leeks and sausage, and a vegetarian pizza (Logan has learned that he truly does love olives and eggplant, both of which had previously been up for debate). Although we had planned to visit a Chianti winery on the way home, we realized we were getting too tired. But that meant that we had to stop at one of the many gelaterias in the town on our way out and (happy) Logan, had his first gelato (they will all be documented, b/c someone has to keep count for the Guinness Book of World Records). He had chocolate with nuts and pinoli (pinenut) flavors. I had coffee and ricotta caramel. The gelateria we found may have been a tourist trap but it was delicious to us and since the sun had recently come out in the hilltown, we enjoyed the cool treat as if it was the best in Italy. Happy to be back at the Villa, we napped very peacefully for longer than intended... again. We awoke at nearly 6pm, realized we had exactly 2 hours before dinner, and headed off for a quick jog. The Villa recommended a short path... which we are not sure we ever found... but we ended up on a grass and dirt path in between the vineyard below the property and a dense wooded area. We ended up cutting straight through the vines (not sure if that was really allowed!) and walked back up the hill just as the sun set. We hurried for a glass of wine and grabbed a lounge chair by the pool to see the last light in the sky. Afraid we'd be late for dinner, we had to head in to shower. As I was finishing getting ready, Logan noticed that he had a slight internet connection in the room and decided to take a peek at our awesome wedding photographer Jasmine's blog... just in case our pictures were up... and they were! What a treat! I can't imagine being in a better spot to be reminded that only 4 days ago, we had the most amazingly beautiful wedding day. I think God knew what he was doing with the rain and clouds, because the lighting of the photographs could not have been better. 10/09/08- It is our last day at the Villa...got up way too early again... so we decided to be at breakfast pretty close to opening time at 8:15. Same delicious spread was available with a new breakfast cake... really no idea what was in it but it was amazing and went perfectly with cappuccino. We headed up to reception and found our favorite girl behind the desk- she is so friendly and wants to make sure that you know where you are going so that your day will be the best. We told her we wanted to go to Chianti and that we were looking at the Castello di Verranzanno and Greve. She loved our choices and suggested that we end the day with lunch at her favorite restaurant in Volpaia (a town of only a few houses) rather than trying to fit in a second tasting. She mapped out a route for us and called the Castello to make us a reservation on the wine tour. If we could get there by 10am (it was now 9:30), we could join the tour with tasting for only 18 euro... so we were off! We were speeding along the highway (apparently we think we know our way around well enough to do this now) and finally reached Greti on the Chianti road where the sign for Castello di Verranzanno appeared on our right. We were about 5 minutes late, so I jumped out of the car immediately and ran into the store right of the road where I was told we needed to drive all the way up the hill. Afraid we would miss our tour and getting later by the second, Logan swerved his way up the windy road until we reached the top and were parking in front of a beautiful and ancient castle. I ran out and introduced myself to the man who I was told was the "boss" and he was very kind considering we were now ten minutes late. He was taking us to the gardens where the tour was to begin, when I turned to Logan and said, "You have the money belt- right?"... his blank face told me "No" before he could say it out loud. I knew it had been on my lap in the car so I figured it must have fallen to the floor when I jumped out. Logan was checking the car within the minute, but found nothing. I was in a panic. The money belt not only had more money than we could afford to lose (and the only money we had with us to pay for the wine tour) but also our passports and Logan's drivers' license. Oh losing this would truly be a disaster! I ran down the stairs of the castle to meet Logan and he was already pulling out of the parking spot-the money belt must have fallen out of the car when I jumped out at the store below... all the way at the bottom of the windy hill road! I jumped back in the car and we drove back down the hill in a style of driving that Logan deemed "ninja driving" (I never knew ninjas drove, but I knew I was not in a position to be arguing with anyone). We made it to the bottom, I jumped out, and the woman behind the counter said "You are very lucky... this man (she pointed) was nice to return this". She handed me our money belt still full of our money and documents. I said thank you a million times but had to run back out the door- we still wanted to catch our tour!!! Back up the hill, winding ninja style, 2 minutes later we parked and ran up the stairs. The same boss warmly greeted us, apparently completely understanding the near miss we just had, and walked us to meet up with the tour. He introduced us to our guide who assured us we had missed nothing and after a few deep breaths, we were thoroughly enjoying a tour of the Tuscan castle. Our guide took us into the caves where the barrels are allowed to age the wine. He explained to us the differences between Italian (especially Chianti) wines and French or Californian wines. He talked extensively about the effect that large vs. small barrels have on the wine they store. He loved that we were from California and playfully teased that while California wines were great to meditate with, Chianti was best with an Italian meal. He was proud of Chianti, but not boastful and it was clear that his knowledge of wine allowed him to appreciate wines from places other than Italy, including California. He then took us to the machinery room where we saw the machines that separate the grapes from the stems and the fermentation vats. The smell of wine was so strong in that room. He finally took us to a small dining and tasting room where all of the doors were opened to the Tuscan countryside so that you felt as if you were sitting outside. Wines and bread with prosciutto, wild boar salame, and cheese were all set on the table. We began our tasting. We moved from the table wine, Rosso, which is a blend of both red and white grapes; to the Chianti Classico (barreled for one year), to the Chianti Riserva (bottled for 2 years), to the SuperTuscan (dubbed so by Wine Spectator magazine, because although it cannot be called a Chianti, it is too expensive to be merely known as a table wine). Chianti is a name for wines made either exclusively or nearly so from Sangiovese grapes of the Chianti region. It must be made according to the traditional procedure utilizing the large barrels (although some other wineries name small barreled Sangeioveses "Chianti" as well, the winemakers at the Castello do not think this is right). They were all delicious and the acidity of the wines did make them taste even better if you ate the snacks with them, just as our tour leader told us they would. Finally we tasted a yellow dessert wine called Vino Santo. It was served to us in shot glasses so that we could dip our almond biscotti in the wine. We soaked the biscotti and ate it as if we were dunking cookies in milk and it was delicious. We purchased both Chiantis and the Vino Santo and were happily on our way back out on the Chianti Road. We then headed for Greve, the unofficial capitol of the Tuscan region... which is kind of strange because it is a shockingly small town. We pulled into the funnel-shaped town center and parked right next to the statue of our new friend Verrazanno (whose castle we had just visited). He is famous (a hero, according to our guide at the Castello) for being the first European in New York and discovering the New York bay, where there is now a bridge named in his honor. We walked around the shops lining the center of town, were finished in about 15 minutes, and were ready to get back in the car and find our lunch in Volpaia. We drove deep into the Chianti wine country through many small towns until we took a sharp left turn toward Volpaia. Not knowing what was in store, we climbed a windy road with some of the best Tuscan views we saw in these three days until we reached quite an altitude. Finally we were in Volpaia. There was a parking lot, a church, a few homes, a ristorante, an osteria, and a wine bar. We had been recommended to the Osteria Volpaia and so we headed straight for it without hesitation. We sat outside on a patio overlooking the hillside and reviewed the menu. We noticed how many dogs were walking through the town with their owners and were amazed that people really live up here... it doesn't seem possible that anyone could live in a place that seemed more like a fantasy than reality. This tiny town all the way at the top of the Tuscan wine county could not really exist, let alone serve as the residence to the people who owned or worked in these establishments. Back to our menus, my decision was a simple one: Papardelle with mushrooms and truffles- my dream pasta in the land I had come to for both mushrooms and truffles. Logan ordered a bit more adventurously: orecchiete (pasta like little ears) with pistachios and cherry tomatoes. Both were divine- we agreed immediately that the paradelle was the best thing we had ever eaten-I wish I could show everyone all of the black truffles shaved over the top of this dish. I feel like they could have charged a thousand dollars for the dish (and in the US, they might have), but our entire lunch with Volpaia wines (bianco and chianti) was only 40 euro. 40 euro for the best meal I have had in my entire life. We strolled through the town, chatted with other tourists, and wandered back to our car. We drove all the way back down to the Chianti road and found our way to the speedway and back to the Villa. We tried to resist but a nap was in order. We arose and forced ourselves to stroll the grounds, back down through the vineyards- as close to exercise as we could get. We returned, grabbed the rest of our bottle from the day before, poured our wine, and watched the sunset. We knew it was our best day in Tuscany yet. We spoke again with our friends at the reception desk and told them we needed a final dinner destination (needed? Ok maybe not really needed... but it was our last night in Tuscany and we wanted an exclamation point at the end of this day of complete indulgence). Reservations were made at another restaurant in San Casciano (the town 2 minutes away). We dressed for dinner, drove to town (no directions needed at this point- something we are very proud of), and arrived at Caffe del Popolano. Only a few others inside, we chose a table for two. For what may have been intended as a lighter dinner, we ended up ordering mushroom flan with gorgonzola sauce (vegetable flans are our new obsession- I must learn to cook this) and green pimientos stuffed with ricotta in an anchovies sauce as antipasti, we shared a gnochetti in cream sauce, and had osso bucco and beef stew as secondi. As we sipped our Chianti, I tried to explain to Logan that it was a light meal because we were only sharing a pasta course... but realizing how silly that sounded, we agreed that we should accept the ridiculousness of our meals of food and wine in Tuscany. We were heading to the cities, on to Florence tomorrow, and we would not have the time to focus solely on meals once we were there. I vowed to be more reasonable starting tomorrow... but once the food came, I knew neither of us had any regrets over our order tonight. The highlights were the stuffed pimiento (spicy food was a welcome variation) and Logan's Osso Bucco- the best preparation of this dish I have ever had. We almost skipped dessert, but on our short walk back to the car, we found the gelateria open. Logan had the Straciatella (chocolate milk) which was kind of like a very creamy vanilla with chocolate chunks and I had a few licks. Back home at the Villa, we are so sure we did Tuscany right. We never made it back to Siena (aka parking hell), but we were glad that missing Siena opened up a chance for us to see other smaller towns and we know we will go there next time... just not on market day. We'll be sad to say goodbye to our Villa tomorrow morning. It is an amazing, peaceful place that feels like home after only a few days. We want to come back with family... and we have vowed to be here on our 20th anniversary... not a difficult promise to keep. 10/10/08- We said goodbye to our Tuscan Villa this morning which was very difficult. It required me having 2 of my favorite soft-boiled egg and prosciutto breakfast sandwiches... and Logan having a breakfast plate so huge that I had to take a picture of it. We packed up the room, took some final photos (especially of the bathroom since Logan warned me that it would be the biggest we'd see on this trip) and packed up the car for Florence. We were on our own getting there because the GPS did not recognize the address we were trying to get to in order to return the car. We had to rely on street signs and maps, which is very dangerous, especially in the cities. We reached Florence relatively easily, but once inside the city, it did not take long for us to get completely lost. I finally convinced Logan to pull to the side of the road so I could ask a pedestrian for directions. I asked a woman "Where is the Ponte Vespucci?" and she launched into a series of directions in the fastest Italian I have ever heard. Finally able to get in a word, I said "Do you speak English? ", she said "No" and then continued in Italian for another few minutes. Logan and I tried not to laugh as we waited for her to finish, said thank you, and drove off with no clue where we were going. We drove around for another few minutes, clearly in the wrong direction, and tried asking another woman... leading with "Do you speak English?" this time. She spoke a little and gave us very good directions. Within minutes we were returning our car. Our room was not ready, so we frantically got what we needed out of our bags and handed the rest over to the hotel. We set back out for our first walk through Florence. We had about 2 hours until we needed to be at the Uffizi for our 1:30 pm scheduled admittance, so we walked back to the Ponte Vecchio area and headed into the city. We found a panino shop that had been recommended in one of our travel books called I Fratellini. Two brothers stand behind a counter on a small street and make sandwiches for about 3 Euro each and serve them with glasses of chianti and other red wines for another few Euro. Logan ordered a pecorino (sheep's milk cheese) panino with truffle and arugula with a glass of chianti and I ordered a prosciutto, goat cheese, and arugula panino with a glass of brunello. We took our sandwiches and wine a little ways down the street and sat on the porch of an abandoned storefront where we ate and drank our wine in the street. This was quite possibly the perfect lunch. It is amazing how fresh the ingredients were and how delicious the bread was. Logan and I considered opening this kind of shop in LA... but we're pretty sure we'd never be able to get approval to send our patrons down the street with their glasses of wine. We returned our empty glasses to the wine rack outside the restaurant and headed back toward the bridge. The heat of the day convinced us that gelato was necessary. We found a recommended gelateria near the bridge and ordered berry and fruit flavors (nice and light!). We walked across the bridge and through the South of the river part of town. We made it all the way over to the Pitti Palace, but since we had our Uffizi tour waiting for us, we chose not to purchase museum tickets. Instead, we took a break and sat on the huge sloping, shady hill in front of the Palace. We headed back to the Uffizi, picked up our tickets and enjoyed the next hour and a half touring the museum of Renaissance art all owned at one time by the Medici family. Our free ipod audio tours worked perfectly and we went from room to room in chronological order so that we could see how realism developed in the paintings over time and how the focus with the Virgin Mary and other religious characters shifted in later years to an obsession with Venus and other non-religious subjects. Our favorites were Cranach's Adamo ed Eva (Adam and Eve in case that wasn't obvious) and Michaelangelo's Toado Doni (a painting of Mary, Joseph, and the baby Jesus that is very- maybe overly- realistic, portraying Mary as a very common woman lacking traditional beauty). We thought about purchasing small prints of these paintings, but realized they would be difficult to travel with and thought it better to order them when we returned home. We left the museum, returned to the hotel and got our room. The hotel is very nice and simple, but our room has an amazing view of the Arno River making it worth every dollar it costs to stay here (and our bathroom is pretty big too!). We relaxed for about an hour then headed back out to climb the hill to the Piazza Michelangelo. After hiking up what seemed like hundreds of stairs, we reached the top and were rewarded with an awe-inspiring view of the city skyline. We enjoyed the view, then climbed even higher to where the Church of San Miniato, a beautiful church with an even more amazing view of the tops of all of Florence's buildings. We headed back down through the hill and to our hotel to prepare for dinner. Tonight we decided to try an Enoteca (wine bar) that was recommended in one of our "Eating in Italy" books. The Enoteca was called Frescobaldi and was known for its pastas and extensive wine lists. We had tuscan crostini (one with tomato, one with tonno, one with some type of fresh- I mean I really think it might have been raw- sausage/salame, and the last with some kind of pate) and polenta with baby squid (delicious) to start. Then Logan had a risotto with wild pigeon and I had a homemade wide spaghetti with duck ragu. The risotto was a little disappointing, either not cooked correctly or just not cooked the way we are used to (but I am leaning toward not cooked correctly...). Luckily, the wine list was as wonderful as promised. Logan had a Sangiovese flight of 3 regional wines and then another Tuscan red. I had a local Tuscan rose and then a local red. 10/11/08- What a successful day in Florence... I think we did as much Florence in one day as is possible. We slept through the night- I did not wake up/ wake Logan up at 4:30 am today! We got up around 7:30, had breakfast (again, the hotel provides a nice spread- not as fresh and delicious as at the Villa, but hard to complain about toast with Nutella, rolls with prosciutto and cheese, and yogurt and granola with cappuccino), and set out to meet our walking tour. We were a bit ahead of schedule- that's what happens when two type A, soon-to-be attorneys travel together- so we strolled through the main streets of Florence and walked through Mercato Nuovo, an outdoor market selling leather goods, jewelry, and tapestry, just as they were setting it up. I eyed a couple of leather bags and realized that buying a leather bag in Europe would probably be a good idea... but we had to keep moving on to our tour. We met up with "The Original and Best Walking Tour" (a native English speaking tour, recommended by our guide book) at their office. Within minutes we had met our guide, Sylvia, and our walk began. We started at the Piazza Republica where our guide pointed out the essential differences between Medieval and Renaissance architecture so that we would recognize the styles in buildings throughout the rest of the walk. Then we went to the Orsanmichelle Church, which originated as a grain storeroom, but was converted to a church. We spent a while looking at the statues built in the walls surrounding the church which were paid for by the Renaissance guilds. A guild would commission a statue and would want the subject of their guild displayed somehow in the forefront. One statue was created by Donatello who was told when he finished the man dressed in linen for the linen guild that the head and hands were too large. He agreed to take another few months to work on the statue, did nothing during that time, and placed the statue in its elevated position in the church wall. The guild saw the statue, loved it, and thanked him for agreeing to change it. Apparently, Donatello understood perspective and was even able to squeeze extra money out of the guild for the "extra 2 months work". We then went to the Strozzi Palace. The Strozzis were a wealthy family during the Renaissance, considered the closest competition for the Medicis. Because of this competition the Medici family eventually exiled the Strozzi from Florence, but upon the family's return later, they built a monstrous palace. We moved on to the Piazza di Limbo, which used to be a graveyard for unbaptized babies. Sylvia shared with us that years ago the graveyard was moved, but that less than a year ago, the Pope had declared that unbaptized babies go to Heaven and applied the rule retroactively. In the same spot, we saw a marking from the 1966 flood of Florence showing that the water reached a height twice as tall as we were, causing great damage to the city and its art, architecture, etc. Those markings can be found throughout the city. We headed to another church, the Santo Trinito. In this church, we saw some amazing frescos and also learned about how frescos are made. They have to painted while the plaster is wet. Before the painter begins painting, he must produce a dotted sketch of his work and throw charcoal through the dots onto the plaster to create an outline to help him paint. Even more amazingly, we learned how the frescos can be pealed off the walls to reveal older works beneath them, and then reapplied. We saw one fresco, the fresco that had been painted under it, and the undersketch of the bottom fresco all from the same wall. The tour then took us to the Palazzo Vecchio, where we took a short break for coffee and bathroom. Logan and I went to a cafe and had cappuccino and espresso (standing so that we would not be charged for the pleasure of sitting down...). Then back to the tour where we listened to many stories behind all of the statues in the piazza. We learned of the anti-renaissance movement led by a friar in Florence who demanded that the people burn their possessions. At its height, the movement was joined by Boticelli who burned some of his own works of art. Finally, when the friar criticized even the Pope for being too materialistic, he was burned at the stake right there in the Piazza Vecchio. The tour finally led us through the town to the Duomo, stopping only to admire a round tower which has its own love story about a girl who once lived there. We did reach the Duomo, saw the doors of the Baptistry by Ghibberti, and got in line to enter the Cathedral. Once inside, we admired the art and listened to the story of the attack on the Medici family by the Pazzis, another wealthy family of Renaissance Florence. The Pazzis planned to kill both living Medici men in the Duomo at Easter Mass. However, only one of the Pazzi assassins was successful and eventually all of the Pazzi men and their friends and relatives were killed-totaling over 80 men killed for the life of one Medici. The tour ended and we were tempted to take one of Sylvia's restaurant recommendations for lunch, since she was so knowledgeable about everything else, but I did not want to give up on our plan to go the Mercato Centrale. We had read that the central market was a great place to put together a picnic lunch of meat, cheese, and bread. We entered the market and Logan was a little overwhelmed-I'll admit- it did sound much easier to sit at a table and be waited on than to scour the market for the best products and try to deal with the Italians selling their goods. But, I was kind of excited by the hustle and bustle... so we found a meat counter that looked promising and before we knew it we were walking away with 8 Euro worth of sopresata (an Italian cured pork product that cannot really be described), salame piccante, and a small tub of salsa di funghi porcini. We moved on to a little wine shop, asked the lady (who admitted she spoke only a little English) if it was legal to drink wine on the street- she seemed to say she thought it was ok- so we purchased a half bottle of Chianti which she happily opened for us and supplied us with tiny little plastic cups. Last stop was a cheese counter where we selected a mild, soft pecorino with herbs and bought the last of fresh bread they had left. We walked around the market a little more- upstairs we found the fresh produce market and I saw the most amazing mushrooms- but we were too hungry to stay long, so we took our "picnic" to the steps of the San Lorenzo church just across the street. We sat down, noticed there were a lot of Polizia around and contemplated just how legal pouring wine into our cups on the street was... we decided that they did not look too interested, so we proceeded. The lunch was delicious- Logan said that soppresata was "the best deli meat he has ever had". We quickly realized that we forget to pick up both napkins and utensils, so our hands got a little greasy, but it was well worth it. We jumped up when the wine was gone- the police never looked our way (again, this may actually have been completely legal anyway)- and we headed toward the Accademia. They let us in the museum early for our 2:30 pm tickets and soon after we were listening to our audio tour, looking up at David. No matter how much you hear about David and about how it may be the best piece of art in the world, nothing can prepare you for seeing it. It is huge and yet so realistic, marble and yet he looks like he could walk right off the block. We admired the David for a while, eventually took in some of Michelangelo's other works, "The Prisoners", and were ready to leave after being there for only about 30 minutes. We headed back in the direction of the hotel, with two stops in mind. First, we had to check out Mass times at the Basilica di Santa Croce, which was recommended by our tour guide. Second, in the same neighborhood, we had to go to Vivoli, a gelateria which had been described in one of our books as the best gelato in Italy. Logan had the riso (rice) and asked in Italian "What marries well with this?" - he was recommended chocolate, so he ordered it. I ordered the chocolate hazelnut after asking "E possible, un asagio?" (Is it possible to have a taste? ), tasting the pear con caramello and finding it far too sweet. We enjoyed our gelato on the way back to the hotel and Logan agreed that this was good- very good- gelato. Finally back at the hotel, I was ready to nap... we had already completed quite a day of sightseeing... and I knew we weren't quite done. At around 5, we were back on the town. Mass was at 6 but I wanted to check out the leather goods of Florence before church. We tried a couple of recommended stores, but I didn't find anything I liked and we found ourselves back at the Mercato Nuovo. I purchased a bag for myself and one for our good friend who was back home dog and house-sitting for us- who knows if we really got a good deal, but they sure make you feel like you did by immediately dropping a large percentage off of the tag price. We left the market and went to the church. Mass may have been a little difficult to follow (since it was in Italian), but it was a wonderful experience and Santa Croce was surely worth the visit in any case. The church holds the tombs of Galileo, Michelangelo, and Machiavelli. It also has a fresco by Giotto and a piece of St. Francis' tunic. It is a museum in itself (in fact, if you come at any time other than mass time, there is a charge to enter). After Mass, we returned to the hotel to prepare for our 9pm dinner reservation at the Golden View Restaurant just across the Arno. We had stopped by the night before and made a reservation in the jazz lounge for dinner. We were really looking forward to a night in a more modern place- we love the small osterias and will probably continue to spend most of our nights there, but it was fun to do something different. Before we headed out for dinner, Logan decided to open the window to get a nice view of the Arno River, but the second that he did, hundreds of flies swarmed in... I guess they weren't joking around in the hotel instructions about turning off all of your lights before opening your window. They sent a young bellboy up right away armed with bugspray... but really the best he could do was assure us that those flies, although disgusting, did not bite. We had to leave because of the smell of bugspray so we were off to dinner. We arrived at the Golden View a little early, but while we waited we were brought 2 glasses of Prosecco. When we finally did reach our table, we found ourselves sitting right next to the window, overlooking the Arno and Ponte Vecchio. We had salads (pear with pecorino, walnuts, and honey and a caprese bufalata) and pizza (salsa picante, cherry tomato, and ricotta for Logan and porcini and truffle cream for me). All of our food was delicious and went perfectly with the house red wine we had. We finished dinner around 11pm and were feeling exhausted. What a day in Florence! It felt like we did everything. We are very tired but we now feel like we did Florence justice and are ready to move on to Rome in the morning. 10/12/08- We had our last morning and breakfast in Florence at the Hotel Balestri this morning. Much more of the same delicious treats (we're planning on keeping nutella in our cupboards when we get back home) and cappuccinos before we took a taxi to the train station. We got there in plenty of time and got on the train to Rome. About an hour and half later, and after hoisting our bags up and bringing them back down from the storage racks on the train, we were walking off the train and into the Roma Termini Station. Our guidebooks had warned us about the pickpockets and other scam artists all over the train station, so we were on the lookout. We walked to the Tourist Information stand and bought our Roma Passes (to save us some money on the major sights we were seeing in the city) and then headed to a train ticket machine to purchase our ticket out of Rome to Venice for Wednesday. As soon as we headed toward the machines, I noticed a man who seemed like he may be up to no good. I pointed him out to Logan and he agreed. Logan went up the machine and was working on purchasing our ticket when security approached the man and was asking him to leave- the man initially resisted but eventually walked away. As soon as the security guard turned his back, the man was back and practically landed right on top of the people next to us, pretending to be trying to help them purchase their train tickets. He was very close to us, but we were vigilant and made sure there was no way he would have a chance to steal from us. Happy to be leaving the train station, we caught a taxi outside. We were lucky and got a friendly driver who spoke some English and was happy to point out any sites that we passed on the way to our hotel near the Piazza Navonna, which he said was a very good central place to be staying. He dropped us off at the Hotel Genio about 1 hr before check-in time, so we left our bags with the front desk and headed off for a day full of sight-seeing. First stop- the Collosseum. We were warned that it was far, but we headed out on foot anyway. About 30 minutes later we were walking up to the ancient stadium and we were laughing about how unexpectedly hot it was! We needed to get lunch first and we planned to go to a sandwich shop recommended by our tour book, about two blocks from the Collosseum which was apparently a favorite hangout of the engineering students from the college nearby (hence the name "Caffe della studentes"). We walked up to the counter and ordered the paninos by sight- I took a "primavera" which was salame and vegetables and Logan ordered the "Napoli". After we paid, the owner of the sandwich shop saw Logan with his Rick Steves guide book and said- "Rick Steves?" and Logan said "Yes! "-the man was so excited. He introduced himself as Mario and immediately moved around the outdoor furniture to create a spot for us to sit. He brought us ice for our water... clearly Rick Steves' review of his sandwich shop has been good for his business. We sat and ate and drank water-our sandwiches were delicious. It only took Logan a few bites to realize that he had ordered an anchovy and cheese sandwich- but he loved it! We finished in just a few minutes, were sufficiently cooled off, and were ready to head into the Collosseum. We used our free ipod tour to listen to the story of the Collosseum as we walked around the levels of the stadium. Even thousands of years after the fact, it was hard for me to enjoy picturing the "games" that took place below... animals against animals, men against animals, and the main event- men against men. What is a bit easier to appreciate is that that building has survived so many years and even attempts to tear it down. We walked out of our first ancient Roman site and after struggling a bit to find the entrance in the hot weather (I may have been getting a little grumpy...), we were heading into the Forum. Forum means center- we were getting to see the actual city center of ancient Rome. We again started our free tour- I can't help but think that everyone who sees us thinks that we are some crazy American kids who can't be without our music even as we visit the ancient Roman sites! We walked through the Forum, saw the old justice hall, saw a green bronze door that was original and still standing, saw the spot where Caesar was assassinated and then burned to death, and the many archways and columns. This was a remarkable site and I was pulled out of my bad mood quickly. We walked up a hundred stairs to exit the Forum, got our bearings, and started heading back to our hotel, unsure if we would make our final intended stop on the "Caesar Shuffle" at the Pantheon. We stopped at one of the recommended gelaterias near the Pantheon, hoping that a cool treat would give us (mostly me) a second wind. Logan ordered a combination of crème caramel and spumoni (yuck- but he loved it!) and I had mixed berry with limone- very refreshing. We sat outside the Pantheon, ate our gelato, and were ready to go inside the ancient temple. The Pantheon was a pagan temple to all gods in ancient Rome, but today has been converted to a Catholic Basilica and is filled with statues of Christian saints. When you walk in to the Pantheon, your eyes immediately go up to the dome with the circular window cut out of the ceiling. This dome was said to inspire all other great domes after it- including the Duomo in Florence and St. Peter's. It is notable for its perfect symmetry. The bodies of the first kings of unified Italy are also buried there. It was a short, but wonderful visit and within 20 minutes we were walking back to the hotel, which was only a few blocks away. We were glad to have accomplished so much but also to be heading into our room for siesta time. We made a reservation at a restaurant we read a review of in our guidebook that was in the nearby Campo di Fiori and went up to our room. We have a nice fifth floor room with a balcony overlooking the city. Somehow the light outside is always an amazing and strange pink hue that makes the city look beautiful. Happy to be up away from the hustle of this very busy city, we rested- probably never slept- for about 2 hours and then it was time to get ready for dinner again. We left and walked to the Campo di Fiori, another nearby piazza filled with restaurants, bars, and tourists. We decided to stop and have a cocktail, sitting right on the piazza. Logan had his first beer of the trip, a Peroni- he was amazed at how good it tasted! Back to the Hotel Genio to rest for the Vatican tomorrow... hopefully my ATM card will work or else...??? 10/13/08- If today had a name, it would be called "the day of the walking"... I'm not sure anyone has ever done so much Rome on their feet as Logan and I did today. Our adventures began with money... we needed some. We were up and moving at 7am because we needed to get cash, have breakfast, and walk to the Vatican to meet up with our tour before 10 o'clock. Luckily our hotel is in an amazingly central location that has allowed (or forced- depending on your point of view) us to walk to everything that is worth seeing in this city. Money was the priority since last night Logan got rejected at multiple ATMs and we needed to have about 120 euro to pay for our tour (cash only- apparently Italy is not as credit card- friendly as the U.S.). So we headed back and tried one ATM in the empty Piazza Navona (Rome is not an early morning city), but we got the message "The bank has instructed us to return the card"... not a good start. As we walked to the next ATM, something occurred to me and I asked Logan if he had tried to take out any denominations smaller than 200 euro- he said no! We had been trying to take out more money in US dollars than is allowed in one ATM transaction (maximum of $200). Hopeful that this was our problem, we approached the next ATM and requested 100 euro- and it worked! We put the card back in and took another 100. Phew! We were now feeling much better about our day and the rest of our trip. We walked back to the hotel and went into the breakfast room where we found an almost identical spread of meat, cheese, rolls, croissants, yogurt, cereal and fruits- and I am happy to report the return of the soft boiled egg (although they seem to be overcooking them, turning them into hard boiled eggs...)! We stuffed ourselves, had a cappuccino, and took off for the Vatican. The Vatican is across the Tiber River from the rest of Rome so we walked along the river and finally crossed on one of many bridges that leads to that part of town. Almost as soon as we crossed the bridge, we turned left, and there it was- The Vatican! We were early (shockingly) for our tour, so we strolled around the beautiful St. Peter's Square between the collonades that are meant to represent the arms of the church stretching out from the central St. Peter's Basillica welcoming everyone in. It is a beautiful place, but somehow (and Logan does not understand how this is so) it was underwhelming to me. Even though this is an immense and spectacular structure, in my mind the Vatican was something even bigger. Maybe I expected it to feel intimidating and yet here were thousands of people, of many different faiths, flooding in. The intent to convey a welcoming feeling to those approaching the Vatican was achieved even in its enormity. We finally met up with our tour group and were on our way with our guide Gracelyn, a former New Yorker, who has only lived in Rome permanently for the past 2 years, but has been a frequent visitor for 20. She has clearly been studying the history of the city and the Vatican for even longer than that. She warned us that Mondays are one of the busiest days at the Vatican but gushed when we rounded our first corner outside the Vatican walls and said that there was "no line". In actuality, there was quite a line to get through security- one we would wait in for approximately the next hour- but to her, it was amazing. Maybe it was a trick to keep us all in a positive mood, but somehow we all believed her that we should feel lucky to be in such a short line and we passed the time quickly chatting with the others in our group (one from the same town in California Logan grew up in!) and before we knew it, we were in the Vatican Museum. I apparently should have done a little more research before we headed into the Vatican because I didn't even know we were going through a museum- I thought this day was about the Sistine Chapel and St. Peter's- but we spent the first half of the day in what may be the best museum we have visited while in Italy. Maybe I shouldn't be surprised, considering the history of the power and wealth of the popes, that the Church would hold one of the world's best art collections, but I was. Led by Gracelyn, we moved through countless rooms from primitive art, to medieval art, to the renaissance, to an in-between time she called mannerism (a low point for artistic achievement after the height of the renaissance), and into the baroque. She filled us with so much information about the artists, the social and political influences at the time of each work, and about how the works ended up in the Vatican (or for about 70% of them, how they were returned to the Vatican after being borrowed by Napoleon). It was so easy to listen to her talk because of her clear authority and passion for the art. She was a scholar, but knew how to have a good time, and did not hesitate to poke fun at the works and even some of the popes. Logan and I had two favorite works in the museum: Caravaggio's Deposizione della Croce and Raphael's Transfiguration (of which there is also a mosaic of in St. Peter's). The Transfiguration is the last piece that Raphael's hand ever touched before his young death. In the top half, the painting shows Jesus revealing himself to the apostles after his resurrection- but Raphael did not stop there- he added a bottom panel to the painting in which the family of a possessed boy bring him to the apostles begging them to save him. They search for the answers but fail and Jesus must intervene, telling them that if they had as much faith as would fit in one mustard seed, they could have saved the boy themselves. The Carvaggio piece shows two followers of Jesus holding his dead corpse with Mary mourning in the background, portrayed realistically as an older woman (as she rarely, if ever, is even in the depictions around the time of Jesus' death). The lighting and perspective of the painting are both tremendous. Nicodemus is bending his elbow as he supports the weight of the body and it truly seems as if it is sticking out of the painting toward you. We left the art gallery and took a break for lunch. We had pizza and beer- nothing to write home about (ha! )- and Gracelyn regathered us hoping that the Vatican had not ruined Italian food for us. She led us into the courtyard filled with interesting sculptures and statues and then into a hall filled with statues. We saw hundreds of 2nd and 3rd Century Roman marble statues, many of which were actually copies of Greek bronze statues from a few centuries earlier. Only a handful of the bronze Greek originals still exist- most were melted down for their material during the Dark Ages, so we are left with pieces that are only 2000 years old to see. We learned that most of these statues were originally brightly colored- not the white that Hollywood has convinced us ancient Rome was decorated with. But, of course, by the time these pieces were dug up, the paint was gone. We were then heading toward Sistine Chapel, but first we went through halls of tapestries and maps. We then entered what are known as the "Raphael rooms" where the walls are covered with his (or his students') paintings. We walked through a few of the prior popes' private quarters- a library and a dining room. Still trekking to the chapel, we saw Nero's tub (large enough to fit 25 people). Finally, we were there. Gracelyn had already taught us extensively about what we would see- especially Michelangelo's works: the ceiling and The Last Judgment. Because it is still a chapel, talking is meant to be kept to a minimum inside and she was very respectful of these rules. No matter how much she prepared us for what was inside, we all still gasped when we entered. Although every wall is covered with breathtaking art, you cannot stop your eyes from going straight up. The ceiling is covered by panels telling the story of time- beginning with God separating dark from light, creating the sun and the moon, creating the earth, creating Adam, creating Eve, the temptation and expulsion from Eden, the building of the ark, and the flood. Surrounding these panels are all of the great prophets who foretold the coming of Christ, including some pagan oracles who prophesized the end of polytheism and the rise of monotheism. After staring at the ceiling until we were dizzy, we focused on the wall behind the altar which is filled with Michelangelo's other work, The Last Judgment. The piece shows Jesus with Mary and all the apostles and saints pulling people up into the brightness of heaven and, below, all of the demons of hell are pushing others down. Almost every figure- and there are hundreds in the painting- has a story behind him or her. It is rumored that Da Vinci said to Michelangelo that with that piece he had ruined art for the next hundred years, because everyone would try to emulate this and they would all fail. It is a beautiful work, but also shocking and very dark (not something you necessarily want to have a print of in your home). Eventually, we wandered out of the chapel, through a courtyard, and into St. Peter's Basilica. We happened to enter while the daily Mass was finishing and we heard beautiful singing while we wandered the many sites within this one church. The church is filled with huge marble statues of saints, mosaics of some of the most famous paintings (done in mosaic so they would last forever), and two of the largest bronze statues in existence. We also saw the body of Pope John Paul I, leader of Vatican 2, who, when being considered for canonization, was dug up and surprised the excavators by appearing the same as the day he died. We finished circling the church, saw the beautiful rays of light shining through the alabaster window behind the altar, and heading back out to the courtyard. Our day at the Vatican was coming to a close- the tour was supposed to finish at 4- it was now 6 and we cannot imagine how all that we did could have been packed in any shorter period of time. We thanked Gracelyn and strolled over the national border, back across the bridge into the city of Rome. With only time for a short rest, within an hour, we were back on the street. We headed to the Campo di Fiori for dinner. Although it is a touristy spot, we had multiple recommendations for one restaurant on the romantic square as "the only real restaurant" there. We decided that the atmosphere of the square was worth giving La Carbonara a try. We sat down and read the menu. We determined that tonight would be a pasta and secondi night... who needs vegetables anyway? I ordered bucatini al'amatriciana and Logan had the carbonara (one of us had to!) which we enjoyed with chianti. For secondi, I ordered adventurously- lamb sweetbreads (which the waiter kind of tried to talk me out of, but when I insisted he noted that it was a very "Roman" order- Logan's research of the city had already told us that one of the most Roman types of food is what is called the Fifth Quarter- the name coming from the fact the butchers quarter animals into all of the most expensive parts and then whatever is left is the 5th quarter- food that was adopted into a cuisine by Rome's lower class- but is delicious!) and Logan had a roasted lamb with potatoes which was wonderful- his favorite secondi (meat course) so far on the trip. The food was good- the service was entertaining (not because he was trying to be, he was just sooooooooo Italian- goodnatured, but very short- he didn't have time to deal with American tourists- but we got everything we wanted, when we wanted, and he was never technically rude...) and we were happy. After all the time we had spent on our feet so far today, somehow we reasoned that tonight we should do the "Night walk across Rome". We followed our tourbook from the Campo di Fiori, to Piazza Navona (our neighborhood), to the Pantheon, to the Piazza Capranica (where we saw a huge Egyptian obelisk outside the Parliament building), to the Piazza Colonna (with a 2nd century column honoring Marcus Aurelius), and on to the Trevi fountain. Here we stopped a while, tossed in our coins, making wishes and hoping for a return trip to Rome! I am so glad we came here at night- although it was crowded, it was majestic. We stayed a while before finding a recommended gelateria called San Crispino where we got a little daring in our ordering. Logan had a combination of ginger cinnamon and whisky flavored (again, yuck... but he thought it was great) and I had a chocolate combined with vanilla bourbon (for me, this is a pretty bold gelato order!) We ate as we kept heading north to the Spanish Steps. All along the way, Logan read about the history of each place. Many others were following the same path through the city and it felt as though we were all on some sort of pilgrimage. We sat at the base of the steps, looked up, admired... but did not climb. Our feet were finally done. We splurged on a 5 minute taxi ride back to the hotel and were in bed in less than 10 minutes. We made the executive decision that tomorrow morning we would sleep in, foregoing our 8:30 appointment at the Borghese Gallery. We have to have something left to do when our Trevi fountain wish to return comes true anyway. 10/14/08- Our last day in Rome... and we awoke "late" at 7:45am. But it was so nice to stay in bed and not to worry about rushing out the door. We know we would have loved the Borghese (especially since there are more Caravaggio pieces there) but no regrets! To really appreciate Rome and to reach a point where we'd be ready to leave, we needed to take things a little slower. We enjoyed our hotel in the morning- had breakfast downstairs and then went up to the rooftop terrace. From the roof, there are panoramic views of the city- it is hard to imagine that there is a better view from anywhere else in Rome. In one direction is the Pantheon and in the other is St. Peter's Basilica- looking like it is only a stone's throw away. The view emphasizes the perfect location of our hotel- right in the middle of Ancient Rome and the Vatican. After our restful morning, we hit the streets for the Vatican city again. We walked all the way around the Vatican, up the hill, until we reached the steps down to where the Vatican metro stop is. We were seeking out a restaurant called La Rustichella which is supposed to be famous for their antipasti buffet- a lunch experience that was still on my Italian list of things I must do. We arrived with what we thought to be perfect timing. The restaurant was supposed to open at 12:30 and it was 12:35... but after trying the door and finding it locked, we realized that it was more of a soft opening time than we are used to. We sat on the steps of a church across the street and watched tourists come up from the subway and head toward the Vatican. A few minutes later, we went back to the restaurant and found the door unlocked- we went in. Immediately, we saw the buffet filled with marinated vegetables, cold seafood salads, shellfish, and a variety of fried vegetables. We sat at a corner table and ordered due (2) buffet and the house white wine. The wine measurements on the menu were in cl (which would not have thrown us off if I had stopped to do the simple math of converting milliliters into centiliters-take off a zero!). Unfortunately, we were confused and ordered 75 cl, which is 750 ml-aka a bottle of wine! Oh well, we figured out what to do with it! Buffet in Italy is a little different than in the US because although it is technically all you can eat- here it is only all you can eat that you can fit on one plate (and it is not a large plate). But that did not stop us from feasting. We stacked our plates high with fried zucchini, eggplant, and onions; mushroom salad with parmiggiano; hard-boiled egg with shrimp and a wonderful creamy sauce; baby squid salads; mussel salad; fennel and shrimp salad; mussels in the shell topped with breadcrumbs and tomato sauce; filleted sardines; and amazing traditional antipasti vegetables (marinated zucchini, eggplant, squash, onions, bell peppers, etc.). We ate until we were absolutely stuffed, enjoyed every bite, noticed that we were the only non-locals in the room (which we were proud of!) and headed out, back up the stairs, to the street which surrounds the Vatican. We followed the road all the way back to the front of the Vatican- St. Peter's Square- and to a special entrance called "The Holy Gate" watched by the Swiss Guard. We approached the gate, showed them our confirmation for the Scavi Tour and we were directed to the Excavations Office up ahead. It was a warm day and we had been on quite a hike around the Vatican to make it back from lunch in time for our 1:45 tour and I was very hot. To enter churches and other sacred areas in Italy, there is a dress code for both men and women which requires that shoulders and knees be covered at all times. We were aware of these rules, but because of the hot weather, I had decided to wear a tank top and bring a sweater. Luckily we were a couple minutes ahead of schedule and I could try to take a break to cool off before I had to put my (wool- why?!) sweater on and go into the excavated area of St. Peter's Basilica. Logan and I joked that under the church it would probably either be much cooler or much warmer and, as we descended into the excavated area, it was clear that it would not be any cooler down below. In fact, as soon as we were in the first excavated area and learning about the mausoleum we were seeing, one of the women in our group had to ask to be taken out. She was very warm- probably from a combination of the temperature and a tendency toward claustrophobia. I was worried that my own inclination to get anxious in small spaces might be a problem, but luckily it never was. I must have been too mesmerized by our Italian Vatican guide Laura's descriptions of the amazing tombs we were seeing. St. Peter's is located where it is because in the 1st century A.D. Peter was buried on a hill which stood where the Basilica now is. The early Christians worshipped at his grave site and marked it. The hill had been a pagan acropolis for years before Peter was buried there, which is why when he was killed nearby, his body was taken to this location. It continued to be a burial spot for Romans throughout the 1st and 2nd centuries. It was only when Constantine adopted Christianity as the official Roman religion in the early 4th Century that a Christian church was built in this spot. Constantine did not want the bones of Peter moved, but he had a problem because the bones were on a hill- so his solution was to level the hill. As we descended the excavated area, we saw ancient pagan tombs, then eventually we saw tombs with some early Christian iconography (no crosses, but suns and other symbols to depict Christ- eventually we saw a chi ro symbol on a tomb), and again more pagan tombs. Wealthy families would purchase mausoleums for all of their relatives. Within one mausoleum, we saw a tomb with pagan symbols and another with Christian, showing that multiple generations were buried there. Above theses ancient levels, we found the level where Constantine's church which was built. He put the altar right above the location of Peter's bones. Eventually, the first St. Peter's was built by a prior pope over this location of Constantine's church and then the current St. Peter's during the Renaissance. After many years, one of the popes decided that they should excavate to be sure that they were really on top of the St. Peter's burial spot. So they dug down and below the current altar, they found- without a break- the former altars down to Constantine's church and then a level of tombs in a circle. They found bones, which were not exactly where they expected Peter's to be so they stored the bones for years and kept excavating. Finally in the 1950s, a female archaeologist asked for the bones and investigated further. She found that the soil in the box with the bones was the exact type that would have been where Peter was buried, that the bones were of a first century man who died around the age of 70, that the bones were of a man who was regarded as a great fisherman, and that there were remnants in the box of the materials of a cloak which would have only been worn by someone of great importance- such as a king. On the wall surrounding where these bones were found, the excavators also found graffiti, written by the ancient Christians. Although it is incomplete, it is hypothesized that it says "Here is Peter". The popes agreed that this was too much evidence to be ignored. It was declared that "We believe" that these are the bones of Peter and they were placed directly under the altars in a niche, where we saw them today. Laura told us that, although she clearly believed that these were St. Peter's bones, not all archaeologists are convinced. What is universally agreed upon, is that the empty tomb we saw was certainly St. Peter's original tomb. We left the excavated area, and on our way back up to modern ground level, we stopped and toured the middle level which is where the popes are buried. We finally reemerged into St. Peter's Square. After a quick stop in the Vatican Post Office- which is apparently more reliable than any other in Italy and which makes its own stamps- we were on our way back across the Tiber. We took a slight detour on the way back to our hotel to have one last Roman gelato. The final gelateria on our list of spots to hit in Rome was a cafe called Giolitti. It was apparently a very popular spot- the gelato counter was 3 or 4 people deep! I had a small cone of caffe and strachiatella (chocolate chip) and Logan had a medium cone with tiramisu and biscotti flavors. This gelato was some of the best we have had! We wandered back past the Pantheon to our hotel and had a few hours to rest before our 8pm dinner reservation. At a little after 7, we got in a taxi and headed down to the Trastevere, a region of Rome to the south, across the Tiber. We had the taxi drop us off in the center of the Trastevere at the Santa Maria Church and Plaza. The Church was open until 9 pm, so we went in. The church was 4th century, built by Constantine, and was the first church to be dedicated to Mary. Behind the altar is a beautiful mosaic with Mary and Christ sitting on a throne. It is thought to be the first to show Mary in this capacity. The church is filled with other early Christian symbolism and is one of our favorite churches we have been in so far. We headed back out to the Piazza which was filled with street vendors, teenagers, and probably pickpockets. We stumbled through the cobblestone streets (not meant for heels- I don't know how Italian women do it), and found our way to a quiet street called Via di Genovesi where the restaurant we were looking for was situated. The Ristorante Spirito di Vino (I think there is a play on words here.. holy spirit... or spirit of wine- I noticed that the "d" was lowercase but the "V" was upper...) was recommended to us by Logan's friend Dan, who has not been there himself, but his parents said it was one of the best and most unusual restaurants they went to while in Rome. We walked in and the place was very quiet- only one other table filled. But we were greeted warmly and we chose a table upstairs. Immediately we were poured a glass of Prosecco to enjoy while we perused the menu. It was decided that we would be having one of our beloved 3 course meals- which we like to pretend is how the Italians do it, but each time we order, our Italian waiters seem a bit amazed by the quantity of food we have ordered. We told our waiter that we had been drinking a lot of Tuscan wine thus far on the trip (mostly Chianti) and that we wanted to try something else. He brought us a delicious, big, fruity Sicilian Rossolo which was so wonderfully different than the acidic Chiantis we have been drinking. Our antipasti course was a goat cheese and black grape pie (which we just had to order because we had never heard of anything like it- and it was amazing) and a zucchini and bell pepper terrine which was kind of like a quiche. For pasta or primi piate we had a fusili in a creamy almond pesto and a spaghetti in a homemade tomato sauce (best Logan's ever had) with capers, onions, garlic, and parsley. We were already full, but were glad we had ordered secondi. I had chicken rolled with sage and served with a creamy bell pepper and pistachio sauce- which was a perfect lighter end to the meal. Logan's (not so light) secondi was a slow cooked pork dish- the recipe came from Julius Caesar's cook. The pork is marinated in red wine for 24 hours before it is slow-cooked in leeks, apples, honey and many delicious spices. It was certainly one of the most unusual dishes we have had and is a favorite. As we finished our wine, we were told we should see the downstairs where the wine is kept. However, it is not an ordinary wine cellar. It dates back to the 2nd century B.C.- hundreds of years older than the Colosseum! They said that every step we took down, we went back 75 years. It is a remarkable place. We sat down there and investigated the ancient stones and archways while we finished our wine. We came back up to the restaurant in awe. We weren't quite ready to leave, so we decided there was one more Roman experience we needed to have- grappa! Oh boy- that stuff is strong... we told our waiter (who, by the way, was the son of the owners and whose mother was in the kitchen cooking all of our food) that we wanted to try a grappa. He brought us a Sicilian grappa to tie it in with our wine. It was dark and almost syrupy and very strong. We had started something and our waiter was soon digging into the grappa cabinet himself, tasting the one he had poured for us and at least a few others. He brought us a little of another he was tasting so that we could see the different types of grappa. After only a few sips, I was feeling it and handed mine over to Logan. He happily finished it. We had them call us a taxi, said our goodbyes, and drunkenly stumbled out. A quick ride to the hotel and the day was done. I think we said goodbye to Rome just right. In one night, we had a ton of delicious food, way too much wine, and a visit to a pre-Christ ancient ruin- this would only be possible in Rome. 10/15/08- After quick packing, a shower, and a little breakfast (by the way, Logan has officially begun thinking that breakfast must end with a chocolate croissant... very dangerous! ), we were in a taxi, heading for the train station leaving Rome for Venice- what is essentially the last stop of our Italy tour. The train ride was our longest- approximately 4 hours, but it went by quickly and before I knew it, I was taking my first look at the Grand Canal. We bought vaporetti (water bus) tickets that would last for 72 hrs so that we could get on and off as much as we needed in the next few days. We are staying on Giudecca which is not the main island of Venice, but is directly across the canal from some of the biggest sites in Venice. We took the vaporetti to Giudecca, followed the hotel instructions to walk along the canal, go over the Ponte Piccolo and take the first alley to the right after the barber shop- dragging our bags down the cobblestone streets. We didn't know we were there when we arrived- the hotel looked just like all of the other apartment buildings. Giudecca is mainly a residential island with only 2 hotels- and this little building was one of them! We entered and immediately our surroundings transformed into a modern, upscale hotel. We were greeted and were in our room in minutes, built almost to look like the cabin of a ship... sometimes I feel a bit like it is rocking-maybe it is all the boat riding we have already done (without a seasickness incident yet!). We planned our afternoon a bit, freshened up, and headed back over to the main island- a very quick vaporetti ride across the canal. It let us off in the hub of all the Venice action- St. Mark's Square. We walked through the square, looking up at the glorious Basilica, trying not to get hit (or pooped on) by a pigeon. Although there were a lot of people, immediately I felt a difference from the hustle and bustle of Rome- the crowds moved slower here... we caught ourselves strolling without even intending to. We decided we should put our map away and start exploring the little streets and alleys that lead away from the tourist center. We wanted to head for the Rialto Bridge and our guidebooks said that street signs and maps were essentially useless in Venice. The best way to navigate was to watch for signs that point to the larger destinations, so we were just following signs (some looked more like graffiti than signs) that said "Rialto" or "Per Rialto" with an arrow. We made it through the Campo di San Bartolomio and up to the bridge where there is a wonderful view of the canals. We walked around a little more in search of some of the recommended wine bars where at this time of day (around 6 or 7pm- like a late happy hour), they have cichetti- a Venetian specialty- which are little appetizers, mostly fried, that you can order while standing at the bar drinking wine. We found one of the places- Osteria al Portego- ordered wine (I had a raboso- which is a sparkling light red wine), and started pointing at the cichetti we wanted to try. We had fried mozzarella, meatballs, chicken wings, mixed vegetables, and little toasted breads topped with fish and something that we thought tasted like potato salad. We needed a second glass of wine to finish our snacks. Feeling great, we walked back toward the Rialto Bridge and the canal to find a gondolier. We stopped into a little enoteca (wine shop) where there were big vats of wine (that appeared to be made there). The owner filled a 1 liter water bottle full of the house raboso for 3.50 euro, gave us two little plastic cups, and we were off. We intended to talk to a few of the salesmen and knew that since we waited for nighttime, the ride would be more expensive- about 100 euro. The first place we stopped, offered the ride for 80- we considered walking further and bargaining, but thought this was a pretty good deal (maybe we were just beating the switch to the later evening prices and we didn't want to lose that)- so we took it, jumped down into the gondola and were in another universe. We glided through the smaller canals and looked up at the buildings. We kissed under the Rialto Bridge (for luck?) and continued through what seemed like a quiet, empty Venice- so different from the streets. It was a genuinely romantic experience, no matter how cliche it is, it is still that wonderful. In a little over 30 minutes, we were back out on the grand canal, did one final circle to give us a good view of the Rialto, and we pulled back in to the dock. 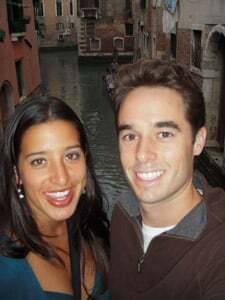 10/16/08- It was day two in Venice! We took our time at the hotel on the sleepy island of Giudecca in the morning, had a light breakfast right before it closed at almost 10am and headed out to catch the vaporetto. We sped across the lagoon to the main island and since we had almost half an hour before we needed to meet our tour group, we headed over to St. Mark's Square. We dodged pigeons, attracted by the tourists who think feeding them (and consequently getting covered in them) is fun, and headed to one of the main cafes on the square. We walked into Cafe Aurora and ordered due cappuccino and chose to stand to avoid the extra charge for the pleasure of sitting. The cappuccinos were the best we have had so far on this trip! We headed back down by the grand canal and toward the Royal Gardens. We stopped and looked at some of the paintings of typical Venetian canals and found one artist we particularly liked who used a method called etching (hopefully we will go back to him tomorrow to buy one!). Time to meet our group, we headed into the garden, checked in, put our headsets on, and our walking tour began. We strolled back to St. Mark's where our guide told us about the history of Venice- how the original Venetians successfully fled to this "muddy lagoon" to avoid barbarian attack 1500 years ago. Eventually, a city was established here and prospered into the main trade center in the middle ages linking east and west over time. To gain religious importance, the Venetians stole the bones of St. Mark from the Muslims in Alexandria (supposedly by covering the bones with raw pork which the Muslims would not go near) and brought them to Venice. St. Mark became the patron saint of the city and the Basilica was built. Around the 17th Century, Venice reached the peak of its wealth- and it was showcased on all of the buildings and art around the town square. Our guide explained to us how symbols of religion and political power are paired throughout the town square and how the symbol of justice is almost on every building. Because of high water (? ), we could not go as a group into St. Mark's Basilica (we'll be back tomorrow), but this left us more time to go through the back streets of Venice with our guide. She showed us many small canals and bridges, typical Venetian courtyards and homes, and more statues throughout the city in the smaller campos. She took us to a mask-making shop and told us the history of the masks in the city. She gave us an idea of how expensive it is to live and work in the city- which has led to the quick decline of Venice's population over the past 30 years. Finally, we reached the Rialto Bridge and ended our tour. Logan and I set out north to a neighborhood we hadn't been to yet in search of lunch. We passed the Rialto fish market- which you can smell from about a mile away! We reached the restaurant we were looking for to find that it was closed on Thursdays for lunch, so we kept walking in the direction of the train station where we were headed to do a tour of the Grand Canal. We found a small pizza place called Pizzeria ai Oche and had wonderful thin crust pizza and beer. Logan's was a 4 stagione pizza (one corner was artichoke, another ham, another mushroom, and another olive). I had a pizza with radicchio, bacon, and gorgonzola- very tasty (and a little smelly). Back down the street, we crossed the big bridge over the Grand Canal and were at Ferrovia- the main vaporetti terminal where we could get on the number 1 boat which would tour the canal slowly. We began our free audio tours, pushed our way to the front left of the boat, and were ready to be amazed. The Grand Canal offers the best view since the city was built from the canal out. All of the most beautiful buildings, and the most decorated sides of those buildings, are on the canal- where everyone would see them years ago. The most amazing are the palaces that line the canal. They are worth 20- 40 million euro, but local laws don't allow any changes to be made to them which is causing them to decay slowly. It is wonderful for us to get to see them as they existed at the height of Venetian culture, but hard to imagine who can afford to own these palaces today knowing of their impending ruin. We jumped off the boat at St. Mark's and got back on another to go to Giudecca. We took a very necessary nap (I was still nursing my first hangover of the trip- not bad considering all of the wine...), then dressed and back to the main island for dinner! First we walked along the Grand Canal and stopped in Harry's Bar for a drink. It is an old-school American bar that somehow has gained notoriety here in Venice (I'll have to check on the history of this). We sat at the bar and had some very expensive drinks- a gin martini for Logan and a glass of Prosecco for me. Our professional bartender in a white tux was very friendly and made Logan's martini so chilled, I thought it would freeze. We ate olives, enjoyed our drinks, thought we saw some older people who looked famous, and were off. We headed down a side alley, back through St. Mark's and vowed to find our dinner restaurant without a map. We knew the general direction and that it was near the Campo Santa Maria Formosa. We walked and eventually saw signs for that Campo- we successfully navigated over small bridges and onto the Campo. We even found the street and the Osteria al Mascaron without pulling out the map- we are improving! We stepped inside to what was a very lively scene and were seated right next to the door in the front room (which turned out to be the best seat in the house!) The owners seemed to be the men up at the front of the house- one waiting on us, one working the wine and antipasti/ cichetti bar, and one in the kitchen. We ordered the antipasto misto plate to share and the pasta al scagliero (spaghetti with mussels, shrimp, and langostino) for two. We decided white wine would go best and had a liter of the house white wine. Our very typical Venetian meal was perfect in every way. We ate everything and were surrounded by fun people. There were Japanese tourists who showed the owners that the restaurant was reviewed in their Japanese tourbook! The tables were close, so we got to know our neighbors, who were all having as much fun as we were. We left thinking that was one of the best experiences we had so far and on to find another "favorite". We picked one of the cafes right on St. Mark's that has a band playing music in front, paid the cover to sit at one of the patio tables, and were ready for a treat. The band was on break when we sat down, but from our seat, we could also hear the music at the adjacent cafe. Our band and theirs took turns playing about 10 minutes at a time so that they didn't have to compete with noise. We ordered a ridiculous mint gelato sundae with chocolate, whipped cream, and cookies and two Tuscan dessert wines. It was the perfect way to splurge on St. Mark's Square! The music was wonderful- some very recognizable opera and musical songs- and a crowd gathered behind the tables. We relaxed for about an hour then headed back for Giudecca. What a perfect night in Venice! We have a lot left to do tomorrow... and of course, there has to be a glitch in our plans. The Venetians have planned a public transportation strike- apparently quite common here. We'll do our best to find working vaporetti to the main island and will just pray that the trains are back on schedule the following day when we are supposed to be heading for Milan! 10/17/08- Today was our last day in Venice... we got up pretty early because we had a lot to do and weren't sure how difficult getting to the main island would be. We had a quick breakfast at the hotel (realized that they had the BEST croissants!) and were off to find out if and how often the vaporetti were running. We saw that there was a boat there so we ran! We caught it and were told it was just going back and forth across the lagoon (not going straight to St. Mark's as we had been doing the day before). Today, we would get off right across the water- then walk. It turned out to be a great way to see a part of the island that we had not been to before. We walked over the Accademia Bridge and winded our way over to St. Mark's Square. We bought museum cards that would cover our entrance to the both the Doge's Palace and the Correr Museum. After buying our pass, we first headed over to St. Mark's Basilica- hoping that we would beat most of the crowds (and secretly hoping that the strike might keep away some of the tourists for the day). The area in front of the church was already pretty crowded, but the line was not long. We got in line, reviewed the notes from the guidebook about the interior of the church, and within minutes we were inside. The Basilica was covered in beautiful mosaics and this church, more than probably any other site in Venice, really exemplifies how the city was caught in between the influences of the East and West. The church is also a display of the city's exorbitant wealth- with more different kinds of marble than you can count and gold everywhere. We made our way around the church, viewed the golden altar where St. Mark's body is buried, and followed the shuffling crowd out of the church. Back in the Piazza (the only one on the island), we headed to the Doge's Palace right next door. We passed the line since we already had our tickets, picked up the audio tour, and began. We started in rooms that housed the original columns from the outside of the Doge's Palace. We had looked at some of the copies the day before on our tour, but the originals were really more impressive and still in pretty good condition. They are each decorated differently, some with people, some with animals, some with gods, and some with the signs of the zodiac. Some tell a story and others are just collections of symbols. One of the most interesting ones had the faces of men from all over the world. It was one of the first pieces of art we had seen that represented other cultures in a context other than as the enemies in a war and reminded us that the early Venetians dealt more with other parts of the world than the rest of Italy. We moved on to the central courtyard, upstairs to the Doge's quarters- which were quite small, and through the meeting rooms of the council and senate. The most memorable room was the large meeting room, built during the Republic, which had to have room for all noble men over a certain age to gather and vote on the political decisions. The size of the room shows that the Doge was merely a figurehead and that the strength of Venice came from this relatively unique way of governing. We also visited the prisons of the Palace where we saw graffiti carved into the sills of the windows in the cells from the time the prisons were in use. The Palace was also filled with wonderful art- on the ceilings and on the walls. We ended up buying a postcard of one of our favorite paintings which displayed Neptune, the god of the sea, dumping out a bag of treasures for Venice who sits next to a tamed lion. One of the final areas we walked through (maybe Logan's favorite) was the armory, where we saw ancient weapons, armor, and tools used for torture (not my favorite- this must be a guy thing!) We completed our tour after almost 3 hours and, as we headed out, we agreed that we would need a little break before venturing on our second museum tour of the day. We headed to a recommended pizza place ("possibly the best pizza in town" according to Rick Steves) called Trattoria de Resorto Nono. We found a table on the gravelly patio under a tree (which seemed like a good idea at the time). We ordered from the extensive pizze menu and got a ½ bottle of house white wine. Logan had a delicious pizza with prosciutto, asparagus, and topped with parmiggiano- we will definitely be making some asparagus pizza when we get back- this was such a great combination. I had a zucca e speck pizza. Zucca can mean either squash (a sweet type like butternut squash) or pumpkin-I'm pretty sure this was actually pumpkin- and speck is a thin-sliced cured ham. The pizza was very unusual but tasty! I kept telling myself every time we had pizza that I was in the mood for something very ordinary- but I can't control myself when I see something that sounds so different and yummy- I keep going for the weird ingredients! In the middle of lunch, all of a sudden the weather turned. It was an overcast morning, but fairly warm-out of nowhere, the sky turned dark and the wind started blowing. Shutters on the buildings around us were banging and the trees above us on the patio were letting their leaves fall all around. We covered our pizza and wine with napkins, bundled up, and waited for breaks in the wind to get a bite. Some people went inside as it looked like it could rain any second, but we decided to stick it out. The weather calmed a bit, but stayed cold the rest of the day. Soon we were heading away from our lunch, walking in the direction of the Frari Church. I think the real name of the Church is something like Santa Maria Gloriosa de Frari- it is another church that was dedicated to Mary and the church is somehow associated with the Franciscan order of priests. We had one of our free downloaded tours to listen to as we entered. We stayed in the large, dark knave of the church to start, then turned toward the altar, walked through the original choir area (apparently although most churches had these, they were destroyed during Martin Luther's reformation). Ahead of us we saw the most famous painting in the church- possibly the most famous painting in all of Venice- Titian's Assumption. The painting was controversial at the time it was completed because it shows Mary as a very beautiful and real woman and the Apostles below as dirty, muscular, hard-working men. The Franciscans who were supposed to pay Titian for the work were concerned that it was too sexual, but when others in the Church were interested in the painting, including those in Rome, the Franciscans paid and kept the painting at the head of the altar in the Frari Church. The painting is also unique for this fact- it is very famous and yet still displayed in its original intended location- it has not been removed to a museum. We also saw a sculpture by Donatello, showing a very realistic, almost starving John the Baptist. In the back of the church, Venice's 2 most famous artists are buried: Titian and Canova (a sculptor). We visited their tombs, did a final look around the striking church and exited. From there, we decided to have a quick espresso and do a little shopping. We looked at many shops with Venice's famous Murano glass and picked out a couple of our favorite items. We wandered the streets and headed back toward the St. Mark's area. Somehow, it was already about 4pm- we knew we would be staying on the main island all day, since the vaporetti would be unpredictable, but we were surprised how quickly the day was passing. We had intended to buy a print of a canal scene from an artist near the square, but we must arrived after he had already packed up for the day-although we were disappointed, I think we had done a very good job picking out the best artist among the street vendors and we probably could not have afforded the pieces we were looking at anyway. We headed up the Correr Museum at around 4:30, but found that we had grown a little tired of museums at this point. We still wandered and saw some interesting sculptures by Canova and stopped occasionally to look at old maps and globes, but we were back on the street at around 5pm. We sat for a while (to give our feet and legs some well-deserved rest), enjoyed the view of St. Mark's, and took off in the direction of the Rialto bridge where we were to meet our Wine Bar tour guide Alessandro. We were running ahead of schedule, so we ducked into a little bar for a pre-wine bar tour drink. It was decorated very strangely and Beatles' music was playing- I think we finally determined that it was a cross between a London pub, an American sports bar, and a regular Italian wine bar. We enjoyed the strange surroundings and our glasses of sparkling wine (prosecco for me and raboso for Logan). We got to the Rialto and somehow managed to find Alessandro. We realized we had no idea what he looked like or even about how old he was- which could have been problematic since we were meeting in one of the busiest spots in Venice. Only one other couple was signed up for the tour tonight, so the 5 of us were off. The other couple was from Toronto and we all hit it off immediately (unfortunately, we cannot remember their names...). Alessandro led us over the bridge, to the west, and we went into the first stop on our little tour. At the bar, he ordered us each a glass of red wine and some cichetti. As we had the house red (rosso) and little bites of meatballs and parmiggiano, Alessandro explained to us how he started doing these tours. He "blames" Rick Steves for tricking him into allowing him to put his name in the book as a recommended tour- but he clearly loves what he does and doesn't actually blame Rick Steves for anything! He used to live on Venice, but has now moved to the mainland-joking that we (tourists) finally drove him off the island. But he is quick to explain that he appreciates the importance of tourism for Venice and believes that it is the only way the island will be maintained at this point. We had a second glass of wine and started sharing stories of our trips so far in Italy and Alessandro shared some of his visits to the U.S. as well. Before we knew it, we were two glasses of wine into the night and heading out onto the street in search of the next wine bar. Within minutes we were there- it really does help having a local who knows his way around! At this stop, we had merlot, some calamari, fried olives (Logan's new favorite cichetti) and other little fried bites (maybe potato). We sat this time (we were in the way at the crowded bar, so I think they let us sit for free) and Alessandro ended up telling us in great detail about the history of Venice. He is very knowledgeable about his home town and loves to share. We had another round of merlot and, by this time, it felt like we were all old friends out for a night (it was easy to forget we were paying for his company!) Out on the chilly streets again, we went to one last spot with Alessandro. It was a little fancier and a little more crowded. He told us to wait outside and he came back with big glasses of a very good local Cabernet for everyone. Right behind him was a waiter with a warm crostini with prosciutto and buffalo mozzarella for each of us-my favorite cichetti! I asked Alessandro if drinking on the streets was allowed- he said not really- but he didn't seem concerned. We also all realized that we had no idea where we were- so he took us about ten steps around the corner and showed us that we were right next to the Rialto bridge, just kind of behind it. We finished our wine and said our goodbyes to Alessandro- and paid him- and started to walk away. The other couple was walking the same direction as we were, so we decided to all get another glass of wine together. We found a little wine bar and had 4 glasses of the house red, which they (names still unknown...) bought for us as a "wedding present". 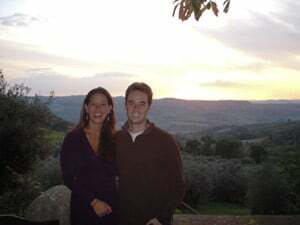 They were heading to Rome next, so we gave them some recommendations to our favorite spots, and after we finished our wine, we went our separate ways. Logan and I found another one of the recommended restaurants, a little off the main roads but in the Rialto neighborhood, called Osteria al Millon. It was more of a traditional (or what we think of as traditional) Italian restaurant with checked tablecloths. We sat down at a table in the corner and focused on the pasta menu. I ordered a spaghetti with ham and cream sauce, that was baked with a very good crusty top and started with a mixed green salad (I have to admit that vegetables tasted good- I think my body may be a little deprived). Logan ordered a penne with eggplant and zucchini in a tomato sauce and started with a really good plate of prosciutto with melon (why have we waited until now to order this?). We unnecessarily had more of the house wine and eventually headed back to St. Mark's. Apparently the strike was still on- we had to wait about half an hour for the boat and then it dropped us off all the way at the end of Giudecca instead of our regular stop. Luckily, Giudecca is not very big and after about a ten minute fast walk, we were back at our hotel. It has been wonderful being able to retreat back to Giudecca each night- away from the packed streets of the main island. Taking the boat back every night has been one of the most enjoyable parts of our stay on Venice. People who stay on the main island probably rarely even use the vaporetti, but to me it felt like such a big part of visiting Venice (and also makes you kind of feel like a local). 10/18/08- We were getting an early start again. We needed to be packed and on the vaporetto back to the train station by about 9:30. We had our usual breakfast at the hotel (in the breakfast room where they play the strangest "American" music) and dragged our bags to the boat. We were told the strike was over- all transportation should be running as regularly scheduled-we breathed a big sigh of relief. We took our last boat (a very crowded one) back to the train station and boarded our train. It was the newest and nicest of all the trains we had been on- so we settled in and prepared for our 2 ½ hr ride to Milano Centrale. We got off the train and immediately headed for the metro station underground. We carried our bags up and down a few flights of stairs and eventually found our way to the metro. A woman walked up to me just as we were trying to decipher the ticket machine. She was handing us something and saying what sounded like "un regalo" (which means " a gift" in Spanish and apparently the same in Italian). I think she thought I was Italian because once she realized we only spoke English, she tried to explain to us in English that she and her husband had purchased all day metro passes that they didn't need anymore. We took them, thanked her, and walked away a little confused- we are so paranoid that we actually considered the possibility that this kind older woman was somehow trying to scam us (did her husband make off with any of our stuff while we were taking the tickets from her?). We still had all of our things so we continued down to the subway. We found our free train easily, before we knew it, we were climbing stairs again, back up to ground level with Milan's Duomo right in front of us. It was a beautiful church in the middle of a vast piazza, but we needed to get rid of all of our bags before we could really enjoy our surroundings. We followed the walking directions to the Hotel Star and couldn't help but notice right away how much easier this city was to navigate than the other Italian cities we had been in these past 2 weeks. It only took us about 5 minutes, even with all our bags, to get to the hotel where we were greeted warmly by a very helpful woman who spoke very good English. Milan was a different city with a different attitude toward American tourists- likely because of the fact that it is more of a business center than any of the other cities. Our room was available for us to check in early, so we put our bags away, freshened up a little and hit the streets of Milan. First priority was food- it was about 2pm and we were hungry! I had read about a little place back over by the Duomo where we were headed anyway which sold mini-calzones. We found the spot easily- Luini Panzerotti- impossible to miss with the huge crowd gathered in the front forming what was apparently 2 lines. We chose a line and by the time we got to the front, we had seen what all the hype was about- people of all ages (mostly locals it seemed) were walking away with greasy, fried calzones that were not really that "mini". We ordered 2 each (they were only 2.50 euro! )- we each had a spinach and ricotta filled panzerotti, Logan had a onion, olive, and mozzarella and I had a salame picante and mozzarella. They were delicious. The exterior was almost like doughnut dough- crispy and flaky but soft and warm. We could see how the dolce panzerotti would have been good too and briefly considered stopping back later tonight for dessert. We circled the Duomo as we ate. When we finished, we stopped and read some of the information about the Duomo, then headed inside. The church is huge- one of the largest in the world- and is covered in both gothic and baroque decoration. The highlights inside included the treasury- where many relics are kept (such as one of the nails from Jesus' cross)- and the sculpture of St. Bartolomeo, a martyr saint who was skinned alive, carved by one of Leonardo da Vinci's student who clearly studied the forbidden science of dissection. We came back out of the church and kept walking. We wanted to fit in as much as possible in one day so we headed in the direction of the Sforza castle, which was built in the 14th Century to protect against a Venetian attack, but was later used to house the Sforza family during the Renaissance. We purchased our train tickets for the express train to the airport for tomorrow, walked passed the restaurant we planned to return to for dinner, and headed back to the hotel for a break. We napped one hour (not enough! ), quickly showered and dressed for the night, and took a taxi to the Church of Santa Maria della Grazie where we had a 6:30 appointment to see Leonardo da Vinci's "The Last Supper". We arrived early to pick up our tickets and walked across the street for a glass of wine. We came back to the church and began listening to our audio tour which explained how Leonardo was asked by the Sforza family, who had given much money to this small church in the hopes that their family would be buried there, to decorate the wall. Again, we were to see a work in the place it was intended to be. After passing through a few airtight rooms (to protect the work from the damage humidity brings), 25 of us walked into the room for the 15 minutes we'd be allowed to view the fresco. As you enter the room, it is on your right and is much bigger than we ever expected. Neither of us knew that it was an entire wall- we expected a smaller painting. We listened as the lively table scene was described on our audio tour. The apostles were all grouped in threes, with Jesus alone in the middle after he announced to the group that one of them would betray him. They all seem to be in motion- it was clearly an intense moment- except for Judas who is still. The apostles seem to be creating a semi-circle- not unlike the colonnade of the Vatican- forming a shape meant to represent the church welcoming in its members. The lighting of the painting was also amazing. It came from a few distinct sources, one of which was intended to align itself with the actual windows of the room on the left of the painting. We could imagine how wonderful that would look with the light of day coming in through the windows! The art was literally breathtaking and so much more than we had expected. We walked out of the room as we were instructed to but we were awestruck. So awestruck in fact that we walked 7 or 8 blocks in the wrong direction before we realized it and trekked back those 7 or 8 blocks to finally start on what was already going to be a bit of a walk to dinner. It was pretty far, but we still arrived in the neighborhood of the restaurant where we were going to have dinner a little earlier than we wanted to (nobody eats dinner in Italy until at least 7:30 and most places don't even open until then) so we decided to stop into a little restaurant for a drink and some people-watching on one of the main streets- Via Dante. I ordered a glass of wine and Logan had a gin and tonic. We stood at the bar right by the front door and enjoyed the view of the street. With our drinks, they had brought potato chips and olives which I thought was a nice treat- but a few minutes later they brought a wood tray with deli meats, cheese, and crostini-we kind of looked at each other confused about whether this was a mistake- we certainly weren't complaining but we didn't want to pay for it either! We convinced ourselves that there was really no way they could have thought we ordered it, so we happily chowed down. We stayed for a while and then headed around the corner for dinner at Le Briciole. We had done our research and found that Milan is not really a city known for its restaurants. Apparently the busy business people of Milan, prefer to eat on the run, so there are fewer real sit-down restaurants known for great food than in any of our other stops on the trip- but the recommendation for this restaurant appealed to both Logan and I when we read the tourbook independently. We headed in, were greeted by a very nice woman (who we think was probably the owner), and taken to a quiet table in the corner. We were very excited to have some food in the Milanese style which includes different risottos and meats lightly breaded and fried. We found both of these things on the menu and so we ordered them and some of the house red wine. I had a risotto with zucchini, seafood (shrimp, octopus, calamari, and langostinos) and a creamy cheese sauce. Logan had a risotto filled with seafood- all the types in mine and mussels and clams and probably a few others- in a tomato sauce. Logan's was almost more like a paella but it was distinctly Italian with the tomato sauce and the rice had the creamy texture characteristic of risotto. It was wonderful to have good risotto after the only other time we ordered it on the trip, it had been a bit disappointing (again, we are of the belief that risotto is not supposed to be al dente). We also had secondi courses- we figured that now was not really the time to start exercising discretion in the amounts of food we were eating. So for our final entrees in Italy, I had a thin sliced steak (almost like a roast beef) with aromatic herbs covering it and Logan had a delicious veal cutlet Milanese style (lightly breaded and pan fried). It was an all-around wonderful meal and we kept telling the same woman (owner) how much we loved everything we ate which seemed to please her greatly. She took us for a walk to the dessert table and we couldn't believe the number of choices, especially because they were all clearly baked and made fresh. She had so much pride when she described "My tiramisu" that we knew we had to have that and we ordered a tasty looking strawberry tart on a shortbread crust. The tiramisu was absolutely to die for and outdid even the one we had in Venice a few nights before. This one was just so homemade and the liquor flavor was so intense in both the cookie layers and the cream. The food was so good that it spurred a conversation that we had started many times already on the trip where we try to name the "best of" many things on the trip (especially food! )- see the list below which is still debatable! We licked our plates clean, eventually paid the check and strolled the couple of blocks back to our hotel. The hotel was really in the perfect location for us to be able to see the city in less than 24 hours- it was central but on a nice quiet street. We went up to our funny room with 2 leopards painted on the wall, got our bags nearly packed, and set an alarm for 5:55am. Our last night in Italy was a good one and we agreed that we were glad we had a quick visit of Milan. It was so distinct from the rest of the trip (much more Northern European Logan thought) and kind of brought us back into the modern world after being in Venice for the last 3 days. It was a real international city where it was easy to get by speaking only English and it didn't even seem like we were treated differently for being American tourists, but we were still in Italy and we got to see some of the most amazing things on the whole trip. We had packed our day, but we were left loving what we saw of Milan and hoping that next time we'll be back here.